When the cursor is on a grid, like the DSTV input dialog in the CIM List, the user can press CTRL-F. A window will open in which the search value can be input. The program will search through the grid to find the first match. Using the F3 key and combination SHIFT+F3 you can continue to search for next or previous matches. Searching capability is supported for both editable as well as read-only columns. The Edit menu of all modules has been modified to provide the new search functionality options as an alternative to the shortcut key combinations. 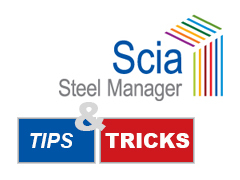 In addition to searching values, new filtering functionality has been added to grid dialogs in Scia Steel Manager 14.0. With a right mouse click on the column header of a grid field, a new menu pops-up where it is possible to set a filter on the chosen column. The “Set filter” option will open a dialog showing all possible values which can be applied for the filter. As a result, the visible records will be limited to the ones containing the filtered values for the selected field. Setting multiple filters on the same grid dialog is supported. Clearing the filter can be done again via a right mouse click on the column header and choosing the corresponding menu items. The options are “Clear filter (All)” which removes all filters on the dialog or “Clear filter (Column) which removes only the filter on the selected column.